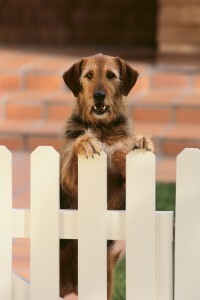 Vinyl fences are also great for dogs! Vinyl fences are lovely, modern, and excellent choices for your next fence project. Because of their uniform construction and appearance, they make an excellent addition to any yard that needs a clean look. Vinyl fences have a ton a great qualities. Are you ready to learn more? Here we go! Keeping a vinyl fence clean is incredibly easy. All you really need is a garden hose and a scrub brush, if you’re feeling festive. Unlike wooden fences, vinyl fences do not require termite protection or painting. There is nothing to stain. You also don’t have to worry about rust or having the fence refinished. A vinyl fence requires the least amount of maintenance, so it’s perfect for people who like to keep busy with work or hobbies. You won’t have to worry about it. Uniformity still includes options for your vinyl fence. We create our own vinyl fences using a state of the art CNC machine and we offer some variety. You can create a picket fence or a privacy fence, whichever will suit you and your home. We also offer different colors so that you can match your fence with the rest of your property. Each piece is uniform, but that certainly doesn’t mean that you can’t mix it up and have fun with it. Economic and green are both on the menu. Vinyl fences are much cheaper than investing in iron or wood because of their initial cost and the cost of their upkeep. Not only that, but they’re completely safe. Treated wood is full of chemicals that can be harmful to those that come into contact with them. So, if you’re looking for a fence that provides you an option that saves your health and your purse then you need to look no further. A vinyl fence will fit the bill. So, ready to invest in a vinyl fence?